With the above said ideology - Mata Bhatee Devi, the school was established in the year 2004. Mata Bhatee Devi, a co-educational Sr. Secondary school is situated in a peaceful and sprawling lush green suburbs of South-West Delhi. The impressive school building boasts of all modern amenities along with scientifically devised-curriculum, state of the art infrastructure, smart classroom, well designed lab block, fully equipped audio-visual hall, indoor-outdoor sports facility and own fleet of buses. 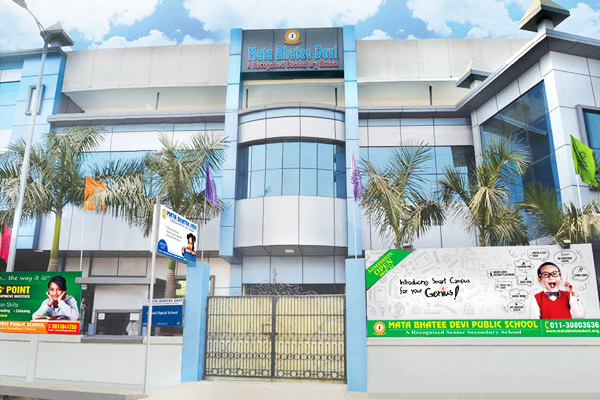 The school is recognized by The Directorate of Education, New Delhi and is affiliated to the CBSE, New Delhi for imparting education up to Senior Secondary level. The School at present offers Commerce and Humanities at Senior Secondary level. The school religiously follows Continuous and Comprehensive Evaluation (CCE) approach, prescribed by CBSE in its curriculum. The curriculum at Mata Bhatee Devi incorporates the best from various sources and muses. The emphasis is laid on understanding every minute need of a student. The curriculum absorbs the idea of practical application of learning disparate from conventional methods of teaching. We, at Mata Bhatee Devi, understand that each child is a distinct individual who needs to be nurtured in order to grow into a mature and responsible citizen. Our academic infrastructure along with a wide range of co-curricular activities help our students in the all round personality development. We have a strong team of motivated teachers who are always ready to accept challenges of developing the potential of each and every student. Keeping in view the ideas of democracy and our ancient culture, Mata Bhatee Devi strives to provide a system of education most suited to the needs of our society today. Stress on innovative methods of teaching , opportunities for shouldering responsibilities during school life, constant participation in sports and co-curricular activities lend meaning to the school life. Thus, the end product is the harmonious, all round developed personality of our students poised on the threshold of life.